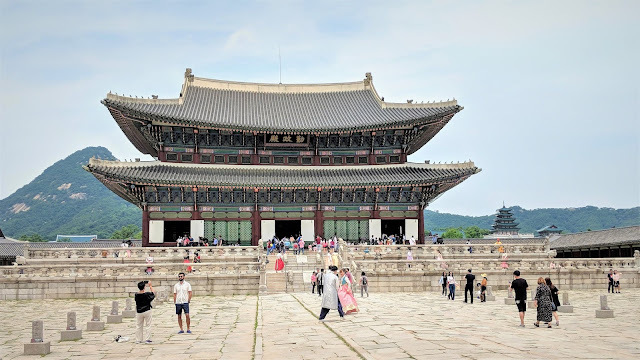 If you are thinking of going to Seoul in Korea and wondering where to go and what to eat, the first stop that I recommend will be Gyeongbokgung Palace. I will be sharing with you some facts, useful tips from my learning experience and most importantly, what to eat after your visit. 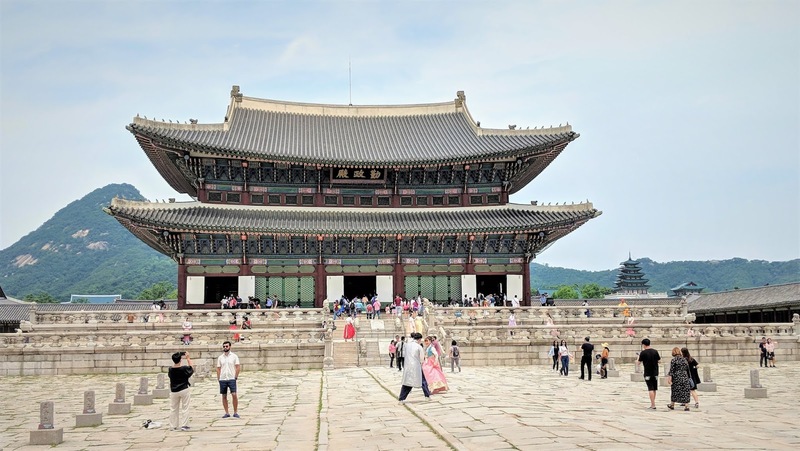 Gyeongbokgung Palace was built in 1365 was used as the main palace during the Joseon dynasty. 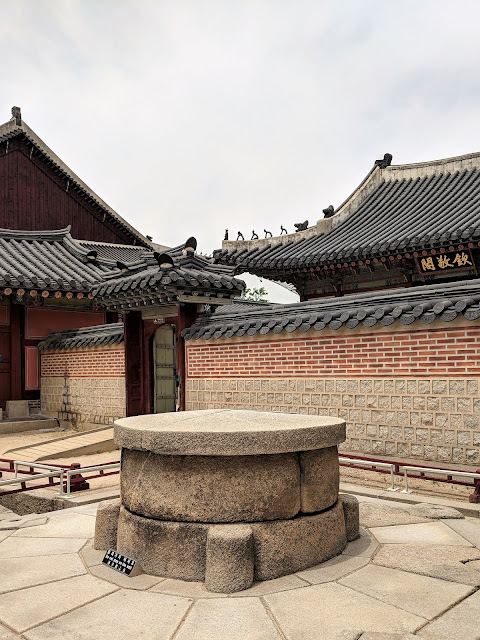 The Joseon dynasty lasted almost five centuries! In Chinese, it is called 景福宮. Gyeongbokgung is easily the most beautiful and biggest palace in Seoul. 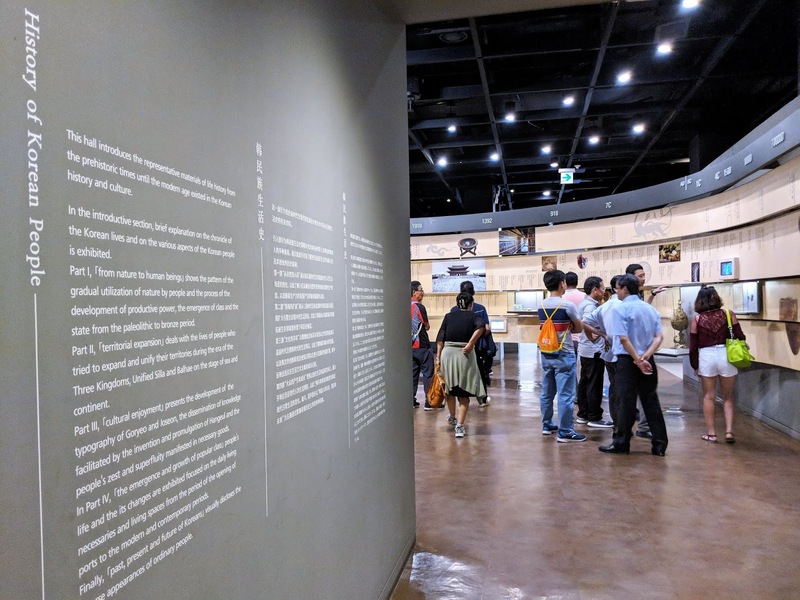 It has since been conserved as a tourist attraction, with museums built in the compound as well as detailed explanations for the different historical buildings. 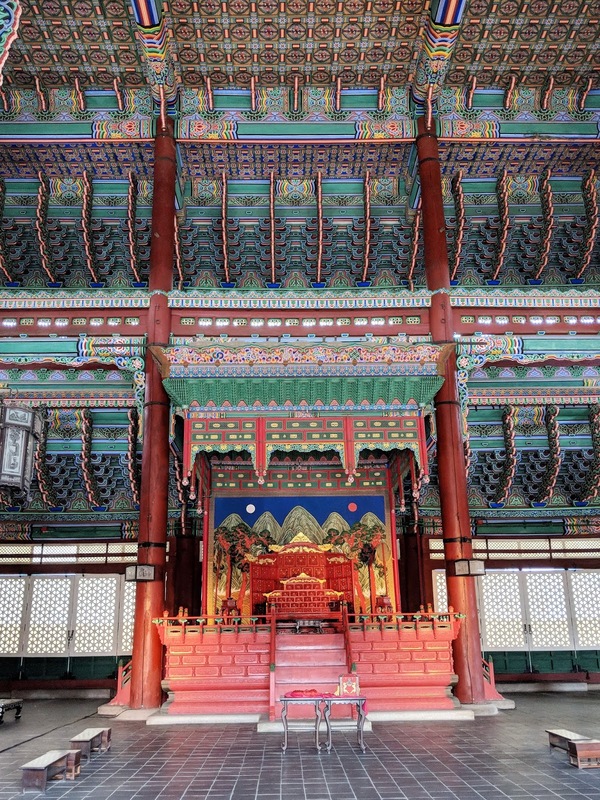 It is easily accessible by the subway and the station is no surprise, Gyeongbokgung. My Learning Experience - Spoilers Alert! Before I stepped into the palace, I was already filled with thrill and amusement because (check out the picture below), I thought I had traveled back in time to the Joseon period. The moment I exited the train at the Gyeongbokgung station, I was greeted with the sight of ladies clad in beautiful Korea traditional costumes - Hanboks. 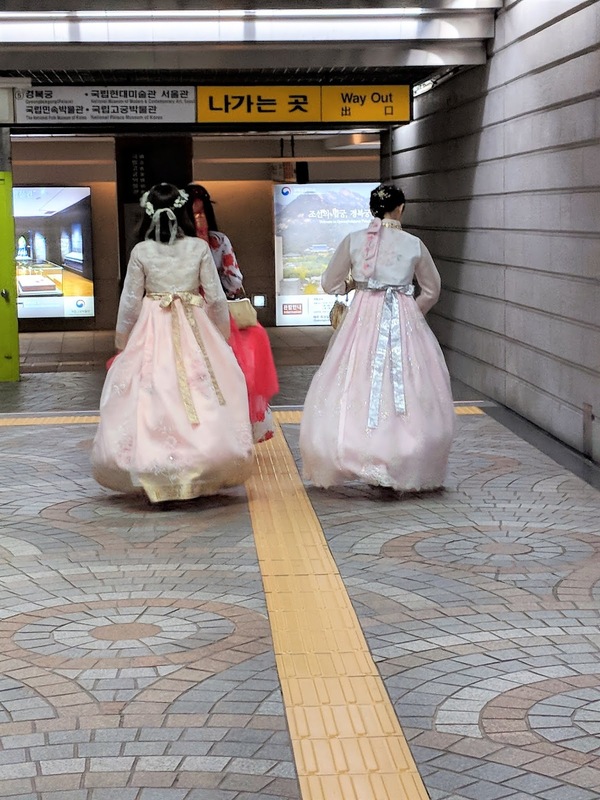 The sight of the modern station was juxtaposed with the ladies in their Joseon attire. When I entered the palace grounds, the view was spectacular as the mountains provided a beautiful backdrop of the historical building. What was even more spectacular was the fact that most tourists gamely dressed the part for their palace experience! Tip 1 is coming up! According to a Tripadvisor, if you rent a Hanbok, the entrance to the palace is free! I truly felt that I had travelled back in time and I was excited. 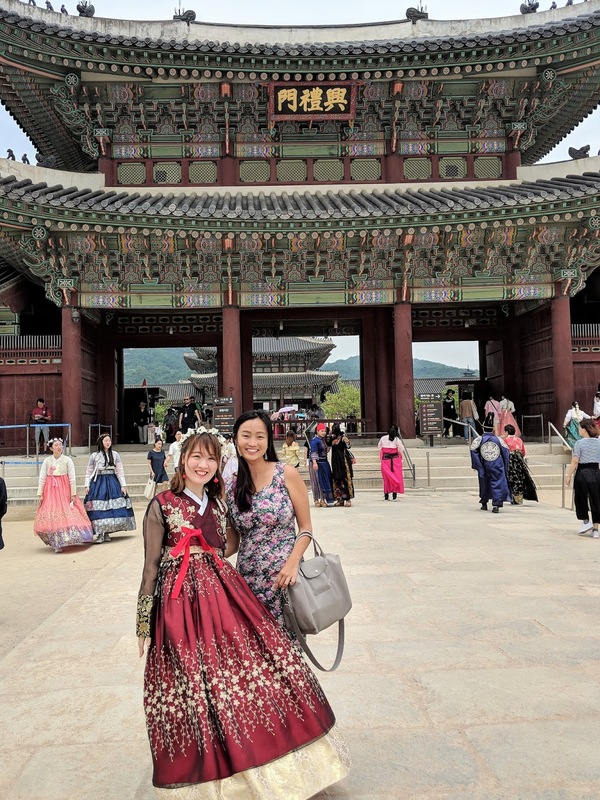 I helped a lady take a picture with her friend and I could not resist asking her if I could take a picture with her in her beautiful Hanbok. By the time I was done with my awe of the entrance, bought my tickets and photo taking of the people in traditional costumes, 30 minutes had easily gone by. I was all ready to explore the palace grounds and I had underestimated the sheer size of it. It was HUMONGOUS. My second tip for you will be to pack sufficient water, some snacks and most importantly, comfortable shoes. For those of you afraid of your face withering under the blazing hot sun, do apply a good sunscreen. 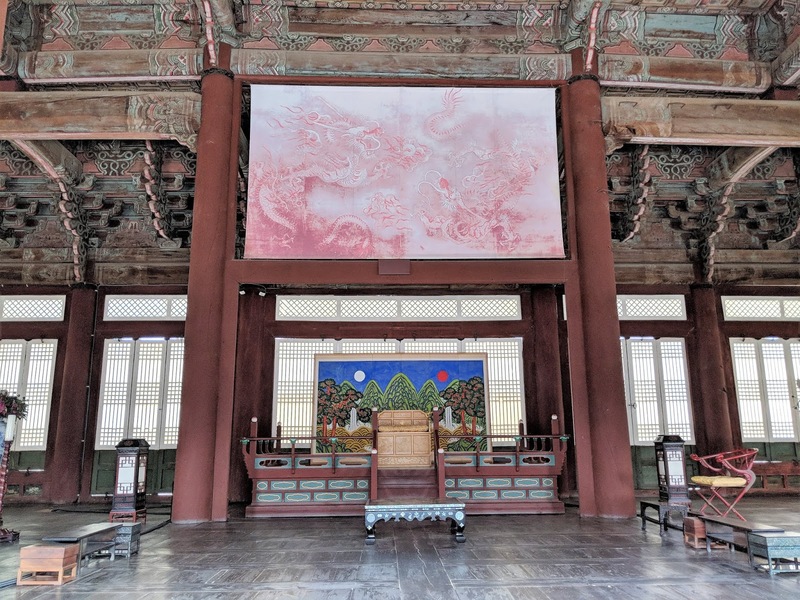 Geunjeongjeon was the palace hall whereby the king would discuss the problems of the country with his royal officials. I am always intrigued with the ceilings of historical buildings. It doesn't matter if I am in Europe or Asia, the people of the ancient past were definitely obsessed with painting their ceilings in intricate designs. 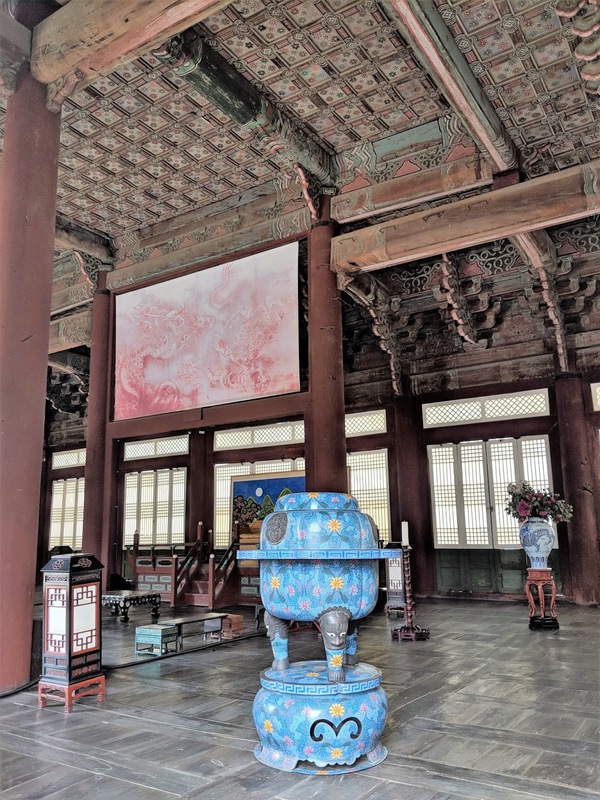 I was surprised that the most important palace hall as shown in the picture above was not as luxurious as it was depicted in Korean period dramas. Other than the elaborate drawings, the feel was more arty than opulent since gold was not heavily featured, unlike the palace in Bangkok. Check out the paintings in Sajeongjeon Hall. Don't you think the height of the benches were very short? Or were they tables in the first place? These were just some of my random thoughts as I was checking the place out. There are two important paintings in this photograph. There is a painting of a pair of dragons and the other one is of mountains. Throughout history, mountains symbolise stability and strength. In the Chinese culture, the dragon is a mystical creature that symbolises power, strength and good fortune. My first impression was that the king was very humble because the living quarters looked simple and not extravagant. The feel of the interiors reminded me of the Oxley House of the late prime minister of Singapore - Mr Lee Kuan Yew. 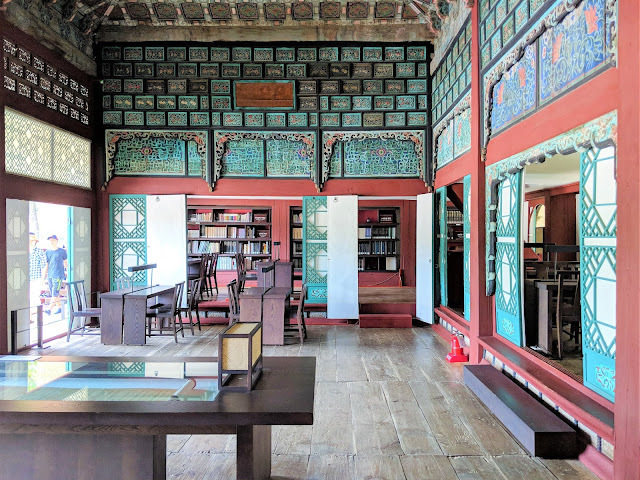 The palace library was located a distance away from the entrance. It was beautiful. Everyone had to take off their shoes before going into the library and we could not make noise. Another tip is coming up. There were important historical books for both adults and children to read in the library. I saw children taking the books and reading. Such exploration was truly impressive. The library also felt very peaceful. We have heard of the famous White House. 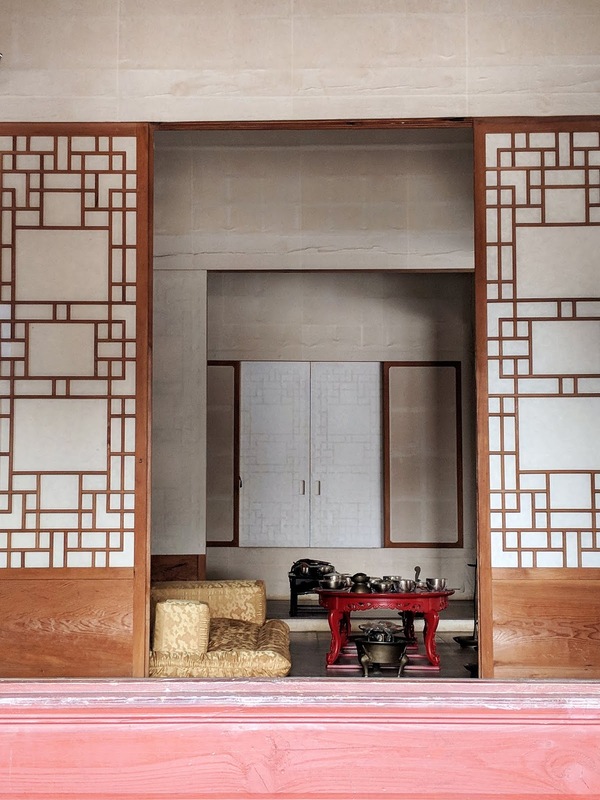 Have you heard of the Blue House? 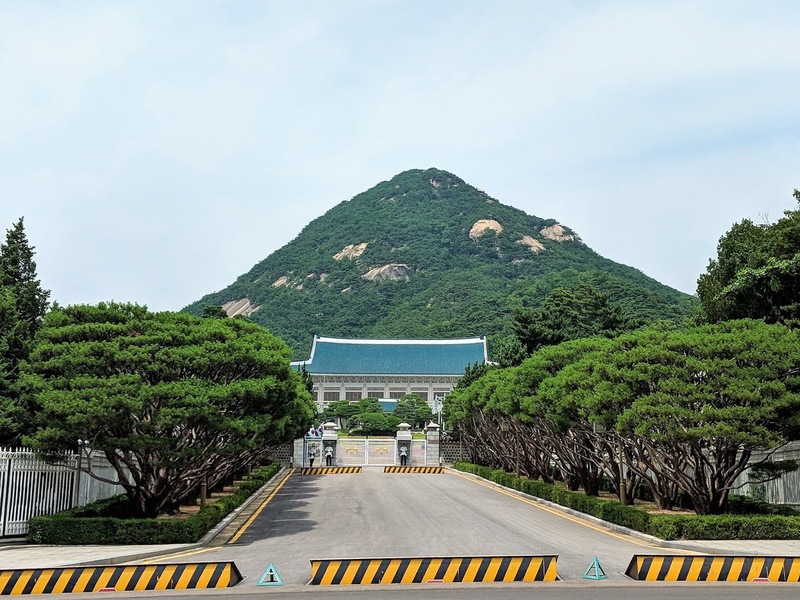 The Blue House, Cheong Wa Dae is the official office of the President of Korea. Check out the Blue House before leaving the palace! I felt that the architecture was very similar to the ones in ancient China. The roofs and the pavilion were very identical. 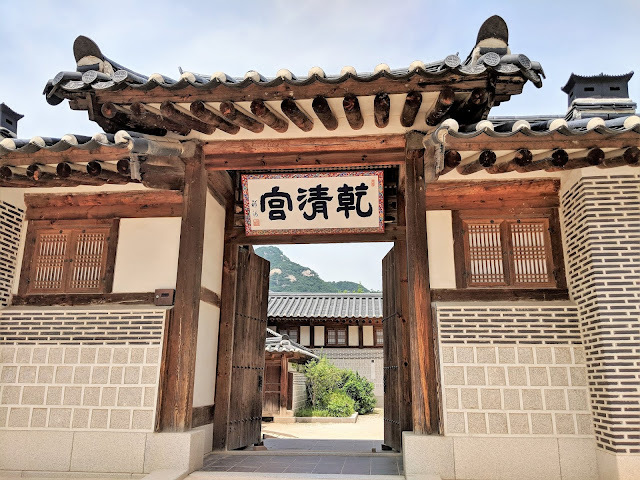 After some research, I discovered that one of Korea's kingdoms, Goguryeo, was heavily influenced by China. 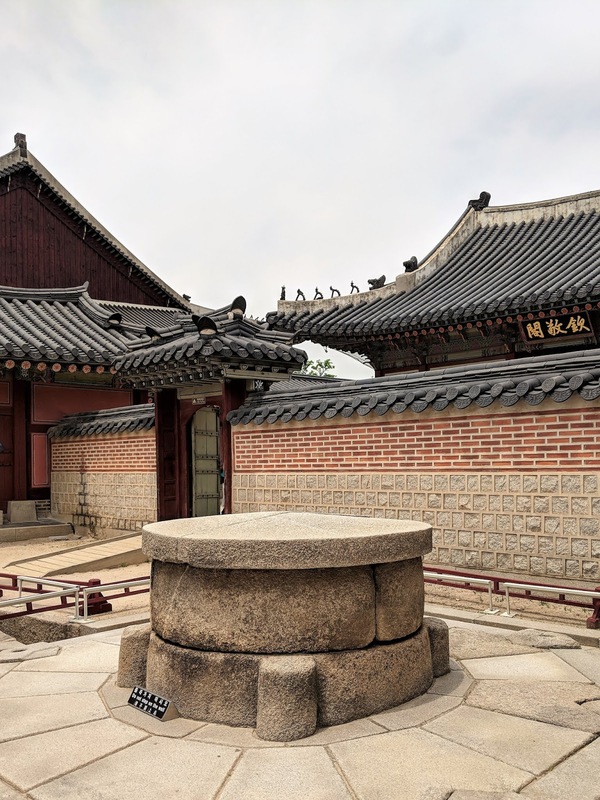 During the Han dynasty, Korea maintained very close ties with China. 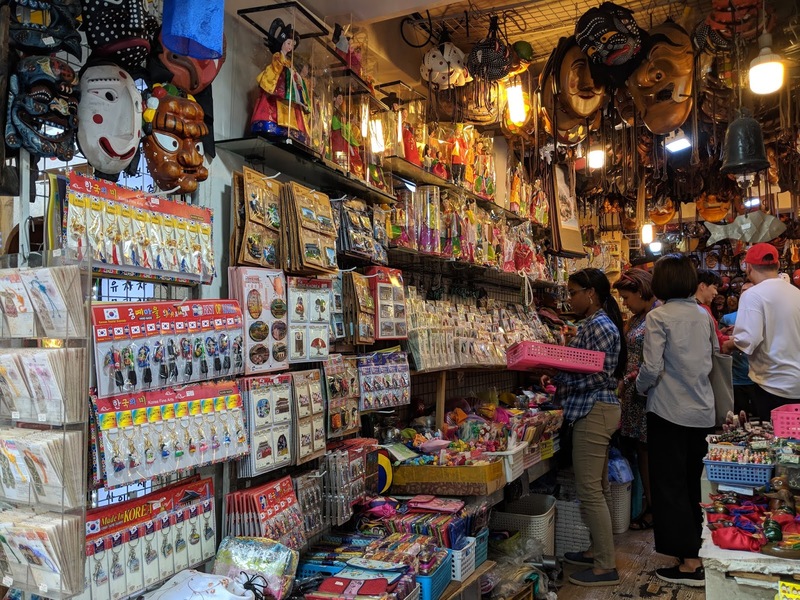 To find out more about China influence in Korea, click here and explore. 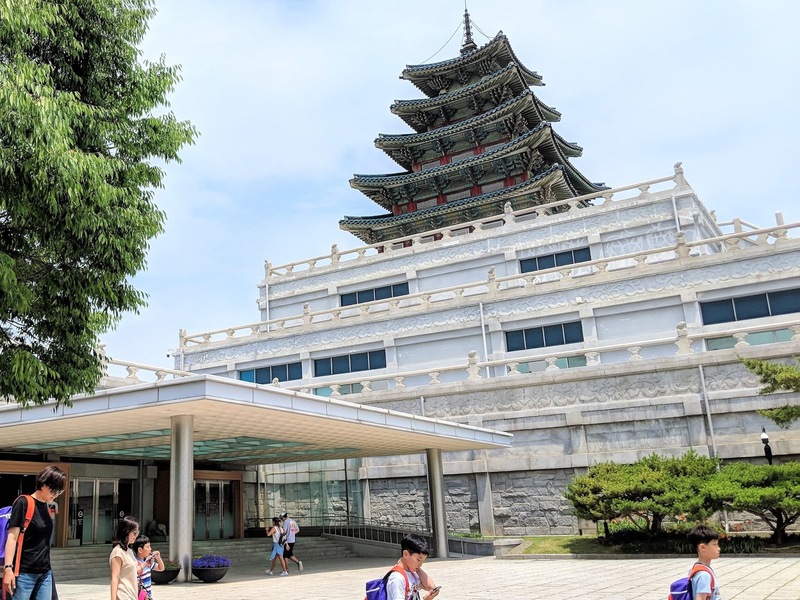 I enjoyed myself tremendously at the museum, learning about the history of Korea and the most interesting fact was that one of the kings had invented the current speaking and writing of Korean language because he found that the Chinese Language was too difficult for everyone in the country to learn. Another important tip for you is to take note of the Palace Guards changing ceremony. I was too deep in the "forest" to return to the entrance to catch their "performance". I also read in another blog that you can rent traditional costumes for free in the palace. You can click here to check it out. After I had completed my Gyeongbokgung tour, I was very hungry. 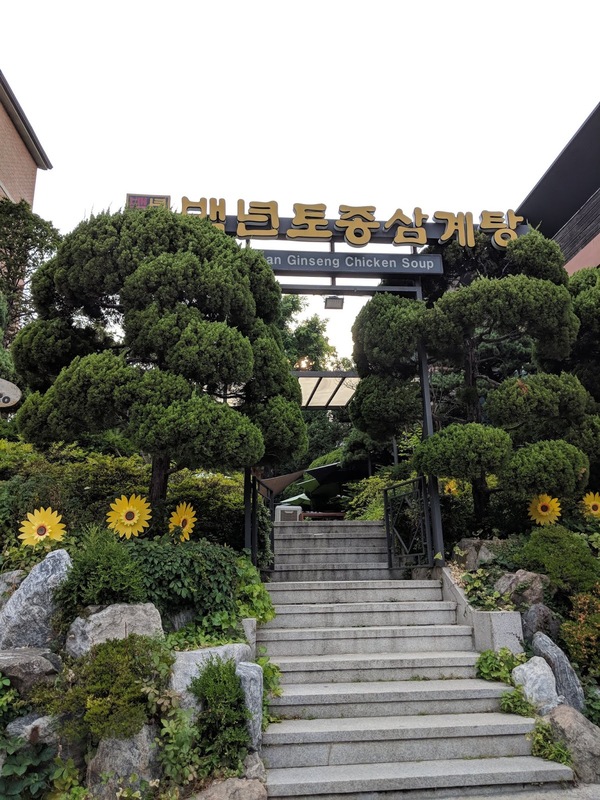 I had planned to go to TOSOKCHAN Ginseng Chicken restaurant as it is EXTREMELY FAMOUS and near the palace. Unfortunately, when I checked my phone for more details, Google informed me that I needed to wait two hours! I have included justinfoodprints Instagram post for you to check out Tosokchan. 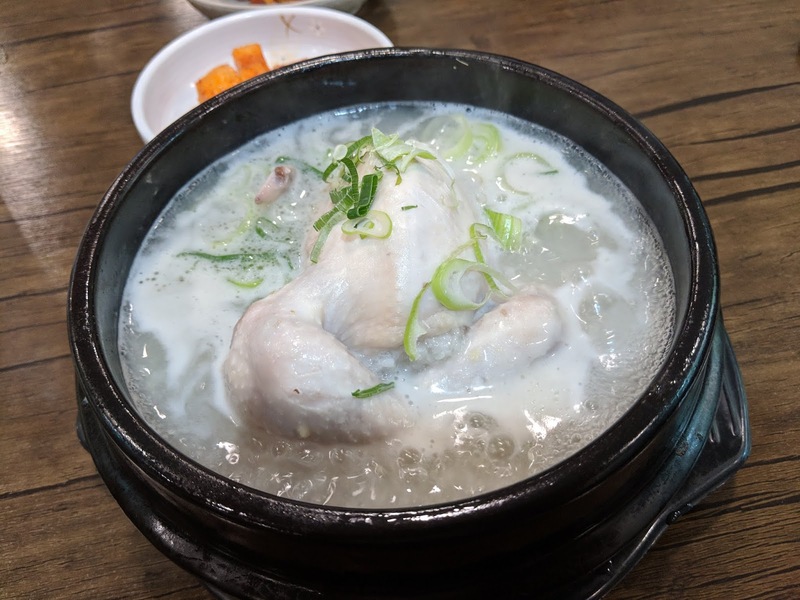 I will definitely somehow try it when I return to Seoul one day because I LOVE Korean Ginseng Chicken Soup. I drank it twice at other shops during my trip. Amazing! 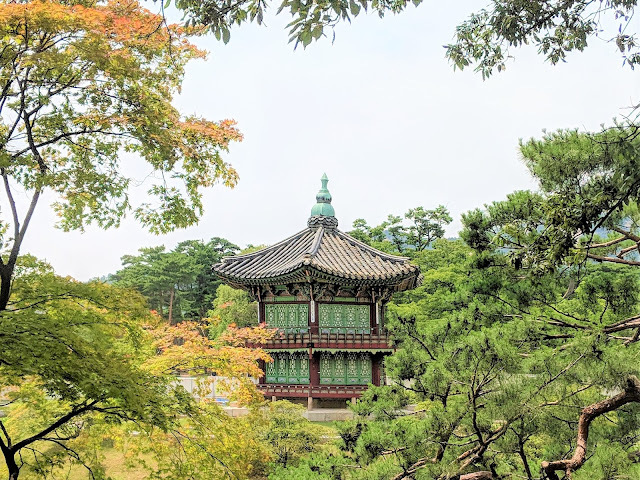 What else to do near Gyeongbokgung Palace? As I like to take things chill, I returned another day to visit Bukchon Hanok Village. 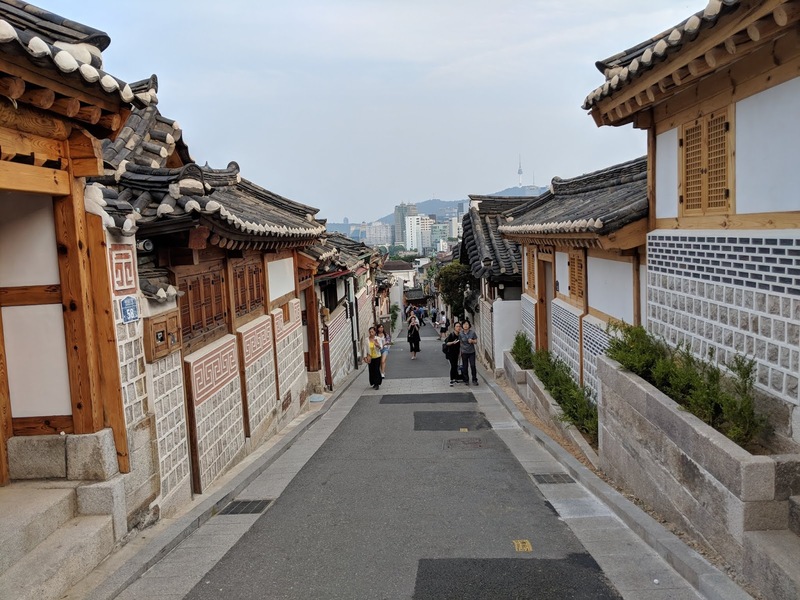 Bukchon Hanok Village is a residential area made up of people staying in traditional Korean houses. 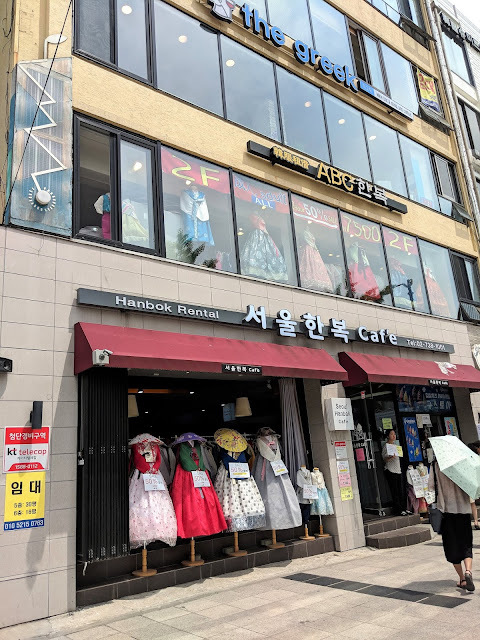 I saw many ladies wearing Hanboks and taking selfies and welfies too. As I was too hungry to wait for the famous Tosukchan Chicken Ginseng Soup, I chose the next best alternative which was called Baeknyeon Tojong Samgyetang (Korean Ginseng Chicken Soup) since it was very near Bukchon Hanok Village and was on the Michelin Guide from 2017 to 2018. I enjoyed it. Korean Ginseng Soup is not bitter and this is why I always crave for it in Korea. 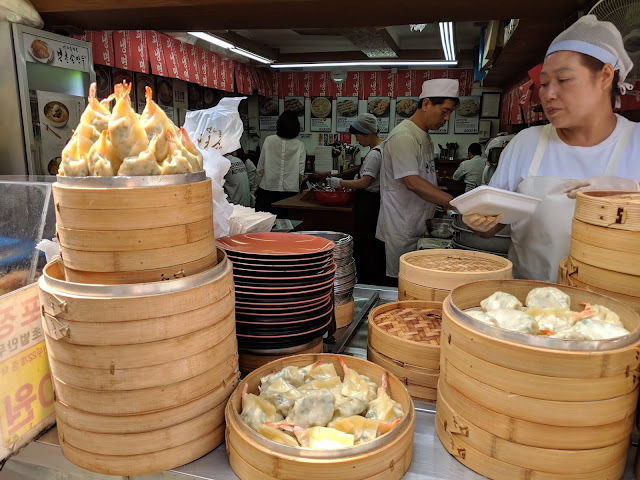 I advise you to go for Tosokchan because when I returned to Singapore, my colleagues were asking if I had tried the famous Tosokchan near the palace! As I like to take things really chill, I returned another day to check out the interesting food and crafts stalls at Insadong. 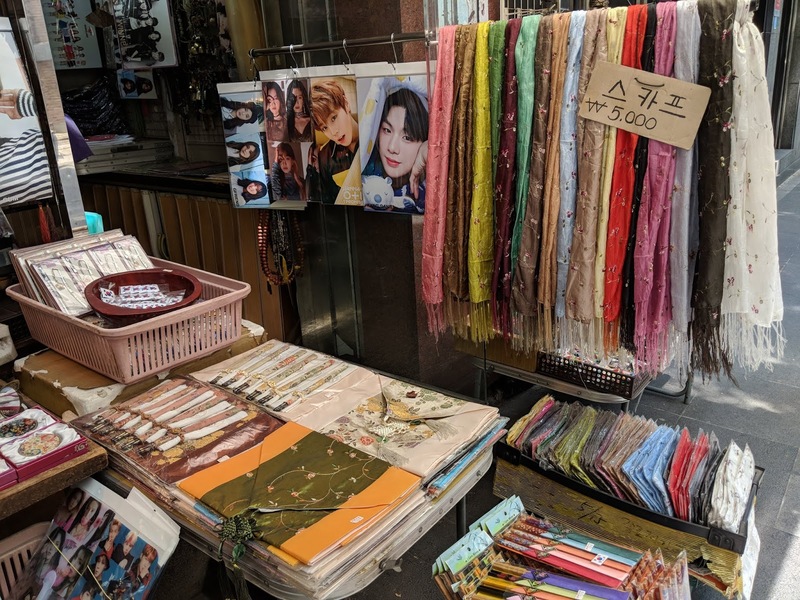 There were many beautiful scarves and this is in fact a good place to buy your souvenirs as the prices were good. The most memorable food was Mandus! 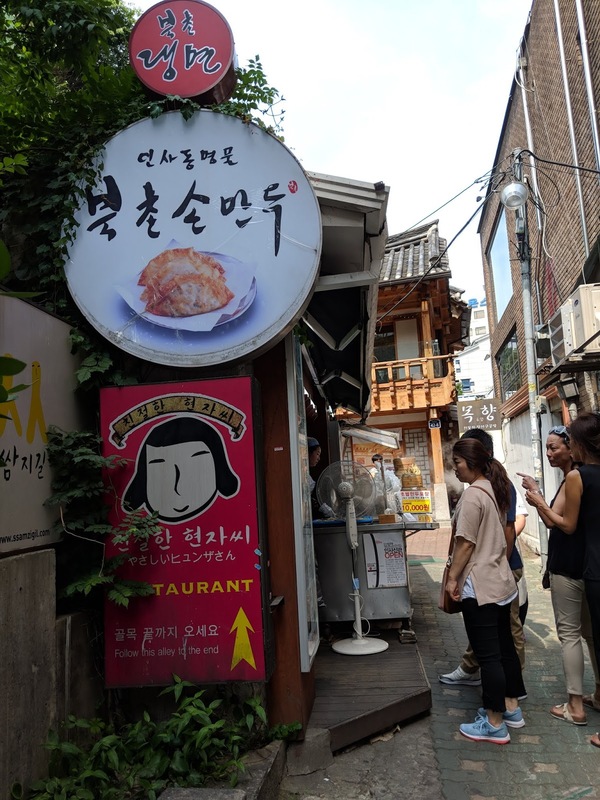 Mandus are Korean dumplings. I tried the steamed prawns ones and they were amazing especially when dipped in the sauces provided. 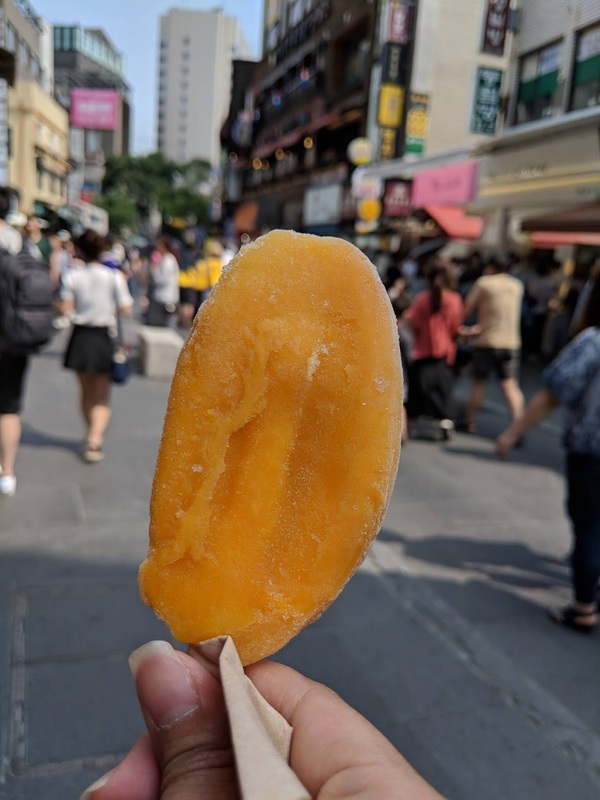 Mango Sorbet on a hot day! I had a mango sorbet to end my hot and fun day! The mango was very authentic. Seoul is so rich in its culture and history. I highly recommend the DMZ Day tour. DMZ (Demilitarized Zone) refers to the border between North and South Korea. 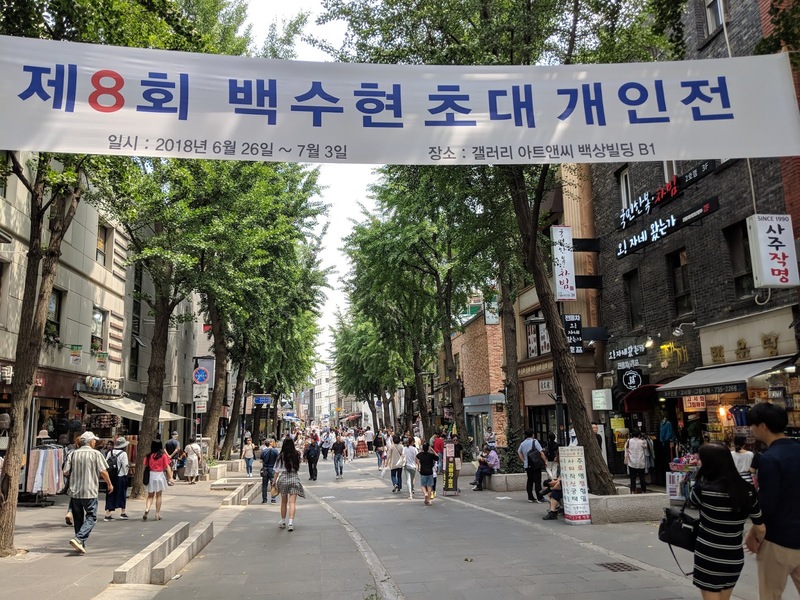 This tour enables me to understand more about the historical background of Korea. Click here to check out my DMZ tour! 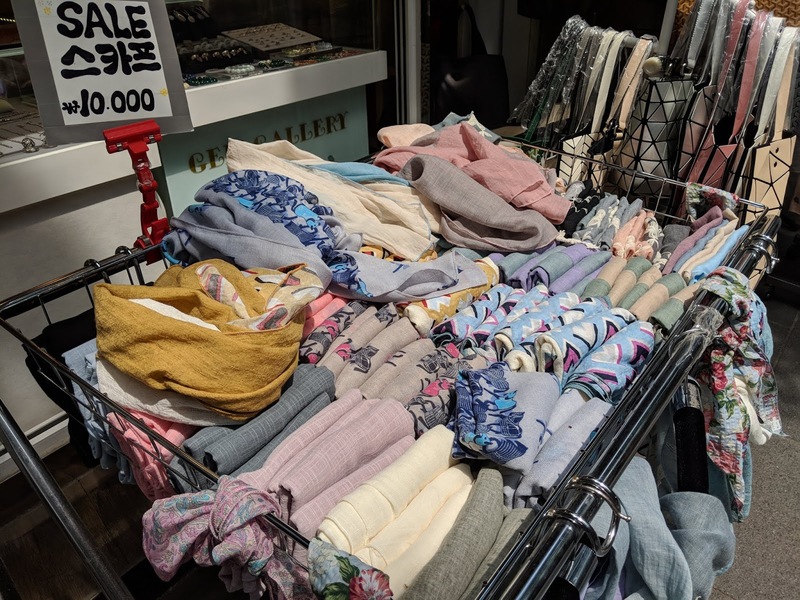 Seoul Part 5 - Gwangjang Market, Dongdaemun late night shopping, Korean Traditional Spa!